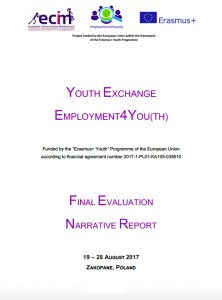 4th publication, fully prepared by European Center for Youth Initiatives, based on the implementation process of ‘Employment4You(th)’ project in cooperation with partners from Bulgaria, Croatia, Germany, Italy, Romania, Slovak Republic and Spain under Erasmus+ Youth Programme. Report showing the whole process, tasks within activities, their aims, is using data collected during Youth Exchange implementation, daily evaluations made by participants, online questionnaires results as well as photos and graphics showing character and category of each activity. Publication is one of the key elements of complex project evaluation. ← [E4You] Brochure is already available!